Having practical, hands-on experience with business operations enables Mitch Weinstein to understand the concerns of his clients and better advise them on corporate, tax and estate planning issues. 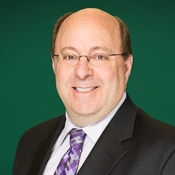 A seasoned business, tax and estate planning attorney and President of Chuhak & Tecson, Mitch Weinstein strongly believes that trust is the foundation of any enduring business relationship, including that between an attorney and client. For decades, he has earned the trust of countless businesses and individuals who appreciate his client-first mentality and steadfast commitment to their success. Mitch delivers clear advice and sound counsel to his clients on a wide range of estate planning, federal and state taxation, general corporate and real estate transaction matters. In his role as firm President, Mitch provides forward-looking leadership and prudent management for a law firm with a proud tradition of legal excellence and responsive service. The practice group leader of the firm's Corporate Transactions and Business Law group, Mitch helps family-owned and closely held businesses as well as midsized companies navigate day-to-day challenges as well as position them for long-term prosperity. Mitch's historical, hands-on involvement in the firm's management and operations, including serving as chair of numerous committees, has instilled him with practical, actionable insights that allow him to provide business guidance based on personal experience, not theory. A certified public accountant as well as an attorney, Mitch is uniquely qualified to take a holistic approach to the issues facing his corporate and business clients. His accounting background reinforces and complements his expansive knowledge of the law, allowing him to offer counsel that incorporates tax and financial considerations along with legal implications. In his estate planning practice, Mitch helps clients preserve their assets and protect their loved ones and businesses. He crafts comprehensive and personally tailored estate plans designed to achieve each client’s unique goals, appreciating that such efforts are as much about family and peace of mind as they are about dollars and cents. Mitch counsels clients in all stages of their lives, from young families seeking to provide for their children to those approaching their golden years looking for continuity and stability through strategic business succession planning. For those with modest estates and high net worth individuals alike, Mitch offers a full range of estate planning services, from the drafting of simple wills to complex trust agreements and advanced wealth-preservation plans. Mitch also advises clients on the formation and operation of private foundations, including governance, tax issues and grant matters. Mitch is a member of Chuhak & Tecson's Management Committee. He is also a member of the Buffalo Grove Planning and Zoning Commission and has served as legal counsel and a member of the Board of Trustees for Temple Chai in Long Grove, Illinois. When not serving his clients or fulfilling his responsibilities as firm president, Mitch enjoys spending time with his wife and children, playing tennis and golf, and cheering for the Chicago Cubs.